Iran successfully launched its second monkey into space Saturday (Dec. 14), landing it safely on Earth after a 15-minute ride, according to Iranian officials. Iran has successfully launched a monkey into space for the second time on Saturday (Dec. 14) and returned it safely to Earth after a 15-minute rocket ride, according to Iranian officials. Iran's space monkey — named Fargam — launched 74.5 miles (120 kilometers) above Earth's surface atop a liquid fueled rocket, according to a report from the state-run Islamic Republic News Agency in Iran. Reportedly, scientists on the ground were able to monitor the monkey's health and metrics about the rocket during the flight. The mission was announced by the office of Iran President Hassan Rouhani. Fargam's flight will help Iranian scientists to continue developing space technology in the future, according to Islamic Republic News Agency officials. The nation plans to send a human to space by 2018, Iranian officials have said. 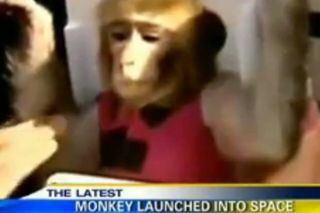 This isn't the first time Iran has sent a monkey into space. While an attempt in 2011 failed, Iran successfully launched its first monkey into suborbital space and brought it home on Jan. 28 of this year aboard a capsule called Pishgam, which means "pioneer" in Farsi. Iran's space agency used the country's Kavoshgar 5 rocket to launch that first monkey flight. A similar rocket appeared to have been used in the Dec. 14 flight, according to images posted by the IRNA news agency. Many Western observers, however, are not convinced that the January monkey launch was actually successful due to the fact that the monkey shown in the recovery photos was different than the one shown in pre-launch pictures. Iranian officials have said that the monkeys in the photos weren't the same because a different monkey was chosen for the flight. Iran could also be planning to send other animals into space. In September, Iranian space official Mohammad Ebrahimi said that a Persian cat could launch to space as early as March 2014. The Islamic Republic's space program has completed quite a few milestones in recent years. Iran sent its first satellite into orbit in 2009 and launched two Earth-observing spacecraft in 2011 and 2012.